Yassin Aref with youngest daughter. Activist Lynne Jackson began her “Journey of Justice” on July 13 in Albany, N.Y. She is walking 133 miles to Binghamton, N.Y., to deliver petitions to U.S. District Judge Thomas McAvoy. The documents’ 1,200 signers advocate that he consider a new appeal by Yassin Aref, an unjustly convicted Muslim immigrant — and that he retry him or overturn the conviction. Jackson and Project SALAM (Support and Legal Advocacy for Muslims) maintain that Aref, a Kurdish imam, was entrapped by a criminal con artist hired by the FBI in 2004. Despite a lack of evidence that Aref supported any terrorist activity, the post-9/11, anti-Muslim climate intimidated the jury into convicting him and his co-defendant, Mohammed Hossain. In 2011, Aref filed a Freedom of Information Act request, which revealed dramatic new evidence that the FBI mistakenly believed he was al-Qaida agent Mohammed Yasin. Yasin was targeted in a pre-emptive prosecution case involving an agent provocateur and secret testimony. 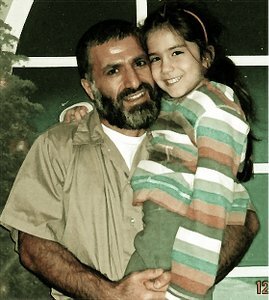 He was sentenced to 15 years imprisonment in 2006; however, Yasin was killed in the Middle East in 2010. Aref remains at an Indiana Communication Management Unit, designed to severely restrict prisoner communication with family members, the media and the outside world. Several activists have joined with Jackson on various legs of the “Journey for Justice.” Because of the searing midday summer heat, the daily hikes go from sunup until 10:30 a.m. and resume from 4 p.m. to sunset; the goal is 13 miles per day. Mike Ehling, the support vehicle driver, and this writer joined Jackson in the village of Schenevus, and then I walked with her for a day and a half on July 17 and 18. As we walked on the edge of the road facing traffic and continued through the countryside of woodlands and dairy farms, Jackson explained Aref’s case. A farmer approached us, listened as we explained why we were walking, and responded with words of support for us and criticism of increased spying by the government’s National Security Agency. A runner training for the November New York Marathon stopped and took a flier. She said she was running with a group supporting breast cancer survivors, and that she would dedicate one of the miles in her race to Jackson, also a survivor. “Are you the woman I read about in the paper?” asked other passersby, as they stopped and expressed support for the human rights’ campaign. Not one person expressed any hostility to us. When Jackson and this writer reached Oneonta, N.Y., on July 18, we spoke at a Quakers-Butternuts Friends Meeting at the First United Presbyterian Church. About 20 people listened as Jackson and Albany City Council member Dominick Calsolaro explained details of Aref’s case and the hundreds of other FBI entrapment cases over the last decade. This writer raised the Fort Dix 5 case, which was then discussed by the other speakers. Afterwards, we walked west until sunset, when swarms of mosquitoes caused the journey to end for the night. This project has re-energized members of Project SALAM and has drawn in new volunteers who have joined the walk or have offered their homes for meals and overnight stays. Democracy Now! 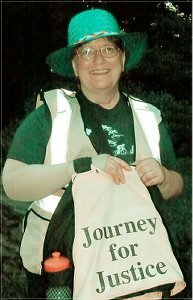 and several Albany, Binghamton and other area newspapers and blogs have covered the Journey for Justice. Even the corporate Wall Street Journal has written about this project. Jackson and other supporters will hold a press conference on July 23 at 11 a.m. outside of the Federal Courthouse at 15 Henry Street in Binghamton before they turn in the petitions. For more information and to add your name to the petition, see projectsalam.org.